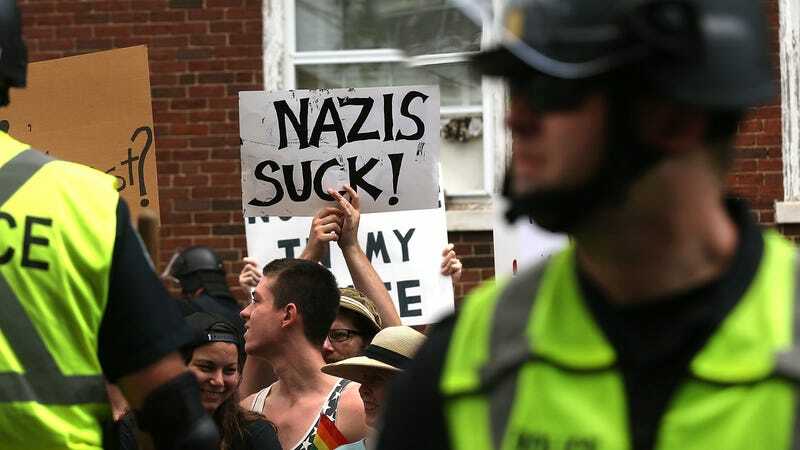 After the Charlottesville protests that resulted in a Nazi murdering Heather Heyer, Donald Trump tried to argue that both sides—the Nazis and the anti-Nazis—were equally guilty of violence. This obvious lie was seemingly supported by a story that went viral recently among right-leaning outlets, in which a man in Colorado claimed that he had been stabbed because he “looked like a neo-Nazi.” The guy, 26-year-old Joshua Witt, told police that he was getting out of his car at a restaurant when a young black man approached him and accused him of being a neo-Nazi because of his haircut, at which point he stabbed Witt in the hand with a small knife. As reported by The Guardian, though, it turns out that Witt made the whole thing up. Police were apparently suspicious of his story almost immediately, because the “attack” happened in a busy parking lot and nobody reported seeing it happen, Witt doesn’t actually have the typical neo-Nazi haircut, and he failed to pick the only suspect out of a lineup. Now, Witt has been arrested for making a false report, and he’s now facing a fine of $2,650 and up to a year in jail if he gets convicted. Supposedly, Witt himself bought the knife at a nearby sporting good store, and he cut his hand while opening up its packaging. The police say that Witt has no known ties to white supremacist groups and that his original Facebook post about the “attack” simply got out of hand—much like how a small knife could get out of one’s hand if they’re not careful, which could lead to one making up racist, pro-Nazi lies.